Read our page on how Blue Light treats acne and you’ll see that it is often a highly effective and safe method of tackling the bacteria that is typically the source of the problem. So, if you are looking to try this method then we recommend the following systems that are typically made by recognised suppliers of IPL Hair Removal Systems who have expanded and adapted their range to treat acne now. The Tria Positively Clear Acne Clearing Blue Light is clinically proven to eliminate acne-causing bacteria deep within the skin, leaving your complexion clear, radiant and healthy looking. Unlike prescription medications or products made with bleaching agents like benzoyl peroxide, the Tria Blue Light is gentle enough for daily use without long-term side effects or skin irritation. It’s compact and rechargeable so easy to carry around and treatment of affected areas only takes 5 minutes a day. Clinical studies demonstrated that 93% of those trying it reported consistently clearer skin in just 2 weeks, with an impressive 70% reporting that their blemishes had completely cleared. 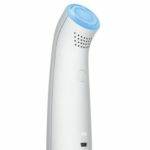 Lumie Clear Acne Lamp has been clinically proven to be effective against mild to moderate acne. It uses a combination of blue light technology that kills the source of most acne (the bacteria in blocked pores) but also has the additional benefit of a red light that soothes and heals the skin. It is compact and very simple to use on any part of your body (it comes with an adjustable stand so you can place on a table, face away and treat your back etc). To intensely treat one specific area it is recommended that the light be held next to the skin for 15 minutes a day, or an hour if standing further away whilst treating a wider area in one go. 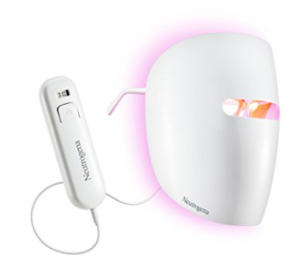 The final device we wanted to show you was the Neutrogena light therapy acne mask. It uses blue and red light therapy but comes as an incredibly handy mask you can wear for a 10 minute session whilst you sit back and relax. The reviews regarding the results are generally extremely positive and as you can see the price is very competitive. However there are an equally high number of people complaining that the activator battery pack is specifically designed to expire after 30 sessions (it has a countdown on an LED screen) – forcing you to buy a new one for around £10.